Kaiser Permanente Hawaiʻi announced the recipients of $188,500 in community benefit grant funding. Get Fit Kauaʻi, University of Hawaiʻi Foundation, Project Vision Hawaiʻi and American Diabetes Association will implement community health initiatives that benefit nearly 50,000 residents living on Oʻahu, Hawaiʻi Island, Maui and Kauaʻi. From left: Annie Valentin, Executive Director, Project Vision Hawaiʻi; Cindy Tokita, client of Project Vision Hawaiʻi’s HiEHiE program; Bechara Choucair, MD, SVP & Chief Community Health Officer; Maria Borje-Bonkowski, Regional Compliance Officer; Dave Underriner, President, KP Hawaiʻi; and Frank Richardson, VP & Regional Counsel, Legal, Gov’t & Com Relations and Community Benefit. Nā Lei Wili Area Health Education Center received $79,500 to continue Get Fit Kauaʻi, a community health initiative with programs and events that support health and wellness for Garden Isle residents. The grant will support six key components to Get Fit Kauaʻi: worksite wellness, safe routes to schools, research and development, heart-healthy nutrition for kupuna, Fitness Week, and the second annual Rice Street Block Party. The program aims to continue efforts to increase biking and walking in the community, increase access to fresh fruits and vegetables, improve the health of Kauaʻi’s workforce and develop a greater awareness of programs available to the community. University of Hawaiʻi Foundation – Hawaiʻi Initiative for Childhood Obesity Research and Education received $64,000 to continue promoting healthy beverage policies at 20 schools in Central Oʻahu through the Hawaiʻi 5210 campaign. Schools have the ability to “earn” water bottle filling stations by adopting policies to reduce or eliminate access to sugary beverages on campus. The ongoing initiative to encourage healthy hydration at school has resulted in 70 water bottle filling stations installed on Oʻahu and Maui to date. With this latest round of funding, HICORE expects to install 20 more stations in the Leilehua-Mililani-Waialua complex, benefiting roughly 16,000 students from K–12 grades. 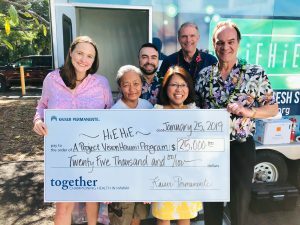 Project Vision Hawaiʻi received $25,000 to support the development and deployment of mobile hygiene trailers on Oʻahu and Hawaiʻi Island as part of its HiEHiE Hospitality Project. 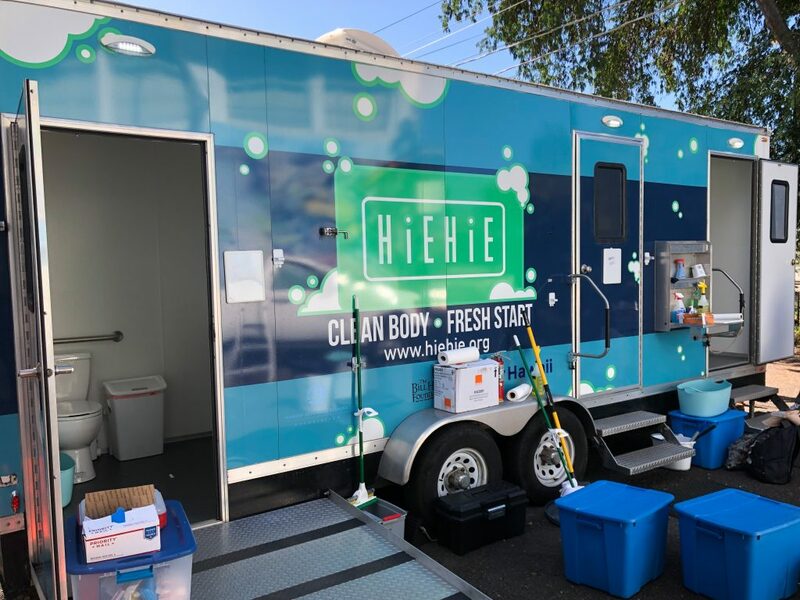 HiEHiE trailers bring hot showers and other valuable resources such as on-site vision and health screenings, referrals, dental care supplies, hair care products and hygiene products to people experiencing homelessness. Project Vision also collects data and feedback in order to inform policy discussions about homelessness and increase access to services. With this grant, Project Vision plans to provide 2,000 hot showers to homeless individuals at 120 pop-up care village events. American Diabetes Association received $20,000 to continue implementing Act 214, which helps students with diabetes get support for their condition at school. The law authorizes Department of Education employees to assist in diabetes testing, insulin administration and glucagon administration in emergencies, and authorizes students with diabetes to self-administer their medication at school. Earlier grants trained 69 DOE employees on Oʻahu, Hawaiʻi Island, Kauaʻi and Maui. With this round of grant funding, the American Diabetes Association will increase educational outreach to 30 more schools, providing 10 workshops to train employees in helping more than 1,000 students with diabetes statewide.